The Pueo – Hawaiian Owl (Asio flammeus sandwicensis) – is considered sacred by many Hawaiians. It is a widely recognized Hawaiian ancestral guardian known as `aumakua. These birds are believed to protect individuals from harm, and even death. Pueonuiakea, an `aumakua from Maui, guides individuals safely back to their home. Hawai’i, being isolated from any other land mass by 2,500 miles of ocean, has no native land mammals. The few mammals Hawai’i has today, such as the feral pig, mongoose and rat are the result of human contact. What Hawai’i lacks in land mammals, it more than makes up with birds, insect and ocean dwellers. The pueo is a subspecies of the short-eared owl. 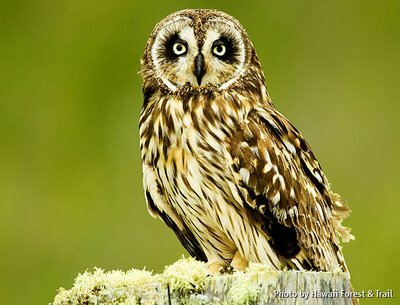 It is a smaller owl, with yellow eyes and a round dark facial disk, and is 13-17 inches long. It is an endemic species, which evolved in the Hawaiian islands and is not found naturally elsewhere. 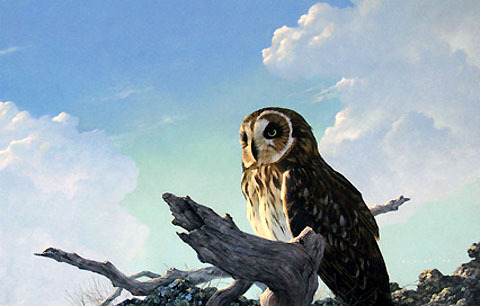 The early Hawaiians arriving on the islands found the owl already present. There is no fossil record of the pueo before the Polynesians arrived here. That may be because the early Polynesians created a habitat that was suited for colonization by the pueo. Unlike the other common Barn Owl, also found in Hawai’i, the pueo is diurnal, more active during daylight, and nests on the ground. The pueo’s modern diet consists of introduced rodents, rats, mice, and small mongooses. Before rodents arrived, pueo is thought to have feasted on the small Hawaiian rail, a flightless bird that is now extinct. Even though the main diet of the pueo is mostly rodents and mongoose, the fact that the pueo is a ground nesting owl means the eggs and young, ironically, are often raided by rodents and mongoose. Pueo lays between 3 to 6 eggs over a span of several months resulting in babies being born at different times. A nest will often have all ages, baby to adult, in the nest at the same time. Owlets begin to fly at about 6 weeks of age. There are no statistics on the pueo‘s population numbers. They are present on all the islands, but they are definitely in decline where urban development makes it impossible for the shy, brown bird to find the green, solitude it craves. 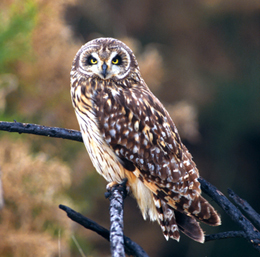 Considered endangered, pueo has become a candidate for threatened status throughout the island chain. The pueo, with all its mysterious wisdom – a bird that flew over the islands well before the first Hawaiians sailed in – is among the oldest physical manifestations of the Hawaiian family protectors, the ancestral guardians, the `aumakua. It was believed that after the death of an ancestor, the spirit could still protect and influence the remaining family acting through a body such as that of the owl, the shark, the turtle, or even the centipede. Each species channeling the ancestor held unique strengths. The owl as `aumakua was specifically skilled in battle. The next time you are met by this wonderful bird, step back, humbly greet it, and feel safely assured of meeting your protector! This entry was posted in environment, history and tagged aumakua, endangered, Hawaiian owl, pueo. Bookmark the permalink. there was no intent to actually target them, andd their families. pplanted trees with some easy gopher control.